The right bug spray can help you truly relax and enjoy your summer, especially if you’re one of those people who get bit all the time. It’s hard to enjoy the outdoors when you seem to be single-handedly keeping alive your local mosquito population. Good news! Manhattan Wardrobe Supply carries products that can keep your swatting to a minimum and your comfort to the maximum. Common bug repellant chemicals have all sorts of drawbacks- they can cause skin irritation, can weaken the immune system and they smell just plain awful. Sure, mosquitos are repelled by the smell… but so are most people! If you don’t want to smell like you’ve been soaking in chemical bug spray all day, but you want something effective, we recommend Jao Brand OutSent. It’s all natural, smells of delicious essential oils like grapefruit, fir needle and patchouli and keeps the bugs away. The bugs don’t like the smell of this one… but we do! Best of all, knowing that it only contains oils, water and alcohol means you can use it on your loved ones with no harm done. 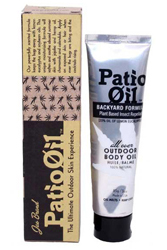 Another great option from Jao is Jao Brand Patio Oil. This lotion uses eucalyptus oil and lemon oil to keep the bugs away, and this one has the extra benefits of soy oil, jojoba, hemp and chamomile to soften and soothe your skin while protecting you from bugs. And whose skin couldn’t use a little extra soothing in the summer? This is great to slather on before all of your outdoor activities, whether you’re hiking, roasting marshmallows or gardening. Keeping bug spray on hand for yourself, your family and guests who may have forgotten theirs is essential in the summer time. You want something that you can throw in a bag when you’re heading to the great outdoors, or leave on the patio for easy protection from those pesky critters while you’re barbecuing in the back yard. 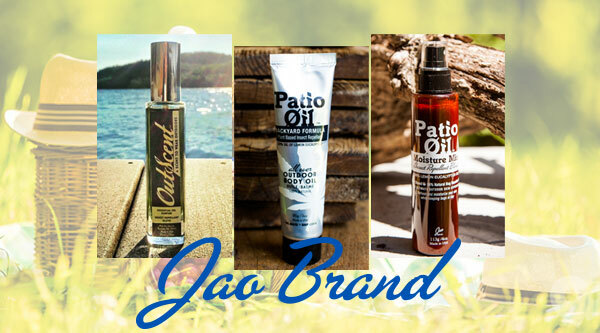 Jao Brand Patio Oil Moisture Mist sprays on easily, and like all of their products, smells nice to humans, but not so nice to bugs. Drawing from lemon oil and eucalyptus oil, it has a pleasant lemon-herb scent and no chemical fillers. Spray on this moisture mist of pure goodness and your skin will feel and smell great! What’s your strategy for keeping the bugs away? Tagged Bug Spray, outdoor fun, skin care, summertime, tips. Bookmark the permalink.